Normally when I am designing a new pattern, a name comes to me quite strongly, along with the reason for the name, there will always be a significant reason or meaning with the name. This time, although there were feelings and ideas, nothing stood out, and the testers and I were calling it “Nameless”. I then thought what a great idea to get all the members of Helen’s Hookaholics (Facebook group) to come up with the name. WELL!!! What an amazingly creative bunch they are, some of the names were very personal, some were very insightful, spiritual, historical, natural, etc. ♥ I finally felt that everyone needs to be a part of naming their own creation, and so the final name given is “My Nameless ……….” you fill in the blank! 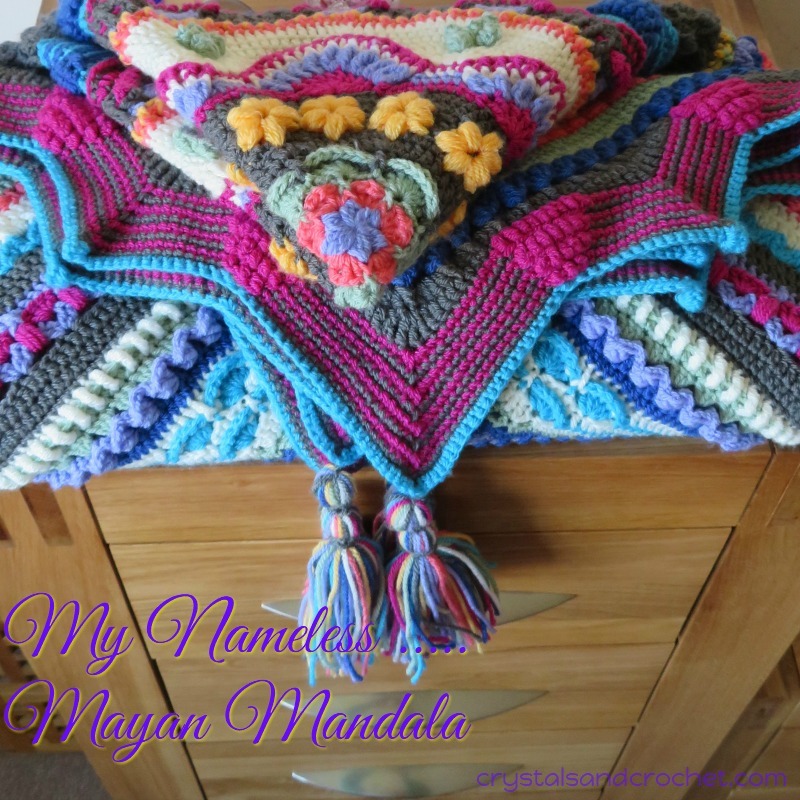 ♥ And so, the nameless becomes named by you, personalised to you or whoever you are making this gorgeous blanket for. Essentially, we have a Mandala/circle, with a lovely new stitch I designed called Puff Daisies. The design then flows out like ripples in time, with petals, pyramids and points. Each of you will see what is right for you to see, each of you will find your thoughts connecting with that which you need to mull over, each of you will feel the emotions which are most healing to you at this time. You will need a maximum of 5000 meters / 5500 yards of Double Knitting yarn and a 4mm hook, or Worsted/Aran weight and a 5 to 5.5mm hook, this allows for colour changes, using just one colour you will need less. Stylecraft yarns are available to buy online at Woolwarehouse and Deramores. Now for all the photos and information on the yarns we used. I wanted to make a blanket for me, to go on my bed, once I move into my new home. I used Stylecraft Special Double knitting, with a 4mm hook. The colour placement in this blanket uses the five  colour placement. 19 x 100g balls – 5605meters/6118yards with some of each colour left. The colour placement in this blanket uses the nine  colour placement. 20 x 100g balls – 5900meters/6440yards with some of each colour left. Terena used Stylecraft Special Double Knitting and a 4mm hook. Ineke’s My Nameless Royal Dutch, the colours are inspired by a hand painted plate that Ineke has. Ineke used Stylecraft Special Dk and a 4mm hook. Here is a separate chart of Ineke’s colour placement for you to download and follow. Lesley used Stylecraft Special Double Knitting and a 4mm hook. Sherrie used a worsted weight yarn with a 5.5mm hook. And a total of 4721 m/5163yds. Finished size is 70 inches square. You can find all the information in Sherrie’s Ravelry project notes. Becky used Red Heart Soft, a worsted weight yarn, and a H 5.0 mm hook. Melissa Leightons My Nameless Moment. Melissa is doing the One Little Work 2018 and it’s her word for the year. She went back to school and is finding this is her moment to do what she didn’t think she could do. Melissa used Loops and Threads Sugar Spun with a 4.5mm hook. Unfortunately this yarn is now discontinued but these are the colours she used. I really love this pattern, but I maar affraid I can’t do this because it is in English. Is it available on the breidagen in Zwolle on the 19th of October? So I can see it there and also buy it there? I’m on row 43 and having a problem. When you say to stitch a triple crochet as well as a front post triple crochet in the same stitch, what do you mean? I read ahead to Row 44 and your hint states to make sure not to miss the triple crochet stitch behind every front post triple crochet, which tells me the 2 stitches aren’t side by side, but one behind the other. Please help! I love your color choices! Could you put one together in neutral colors (tans, browns, etc,) I need to make blanket for my daughter but she likes neutral colors. sorry I have been away…. if you still need help the facebook group is always the fastest way to get that help. but look at the photo round 12 #1 it clearly shows the hdc made over the ch-2 space and into the stitch behind. Hello. I am almost finished My Nameless and was wondering if you could help me put a section at the top to cover the pillows so it looks like a bedspread. Of course I couldn’t figure it out myself so was wondering if you could help. Thank you. Is this pattern available without the picture Tutorial ? Hi – This is an amazing pattern. I can’t get over how different and gorgeous each of these different colorizations look. There are some parts that are so stunning that they automatically catch my eye. I’ve just put this pattern on my must do list. I just saw your Mayan Madness, I live in Playa del Carmen, Mexico, and the colors are so happy and fun. I really want to make this! I’ve just started to crochet so I think this WAY out of my league. But I am going to buy the pattern anyways and see if I can make my way along. Thank you for creating such beautiful designs and I can’t wait to be part of your tribe that has made one or more of your designs. Saludos! it is in the post…..
Hi Helen, I love your designs. Hi Helen, I love your designs… I just saw a mandala on Facebook that was similar to this one but with petals…Is the pattern available? Sorry, one more question please. Can you use Sheepjes Stone washed yarn on this too? I have been dying to try this yarn!! Looks luscious! We can’t run to Wal-Mart or hobby lobby stores to inspect it since they don’t carry it over here. Thanks. I’m sorry it I still don’t see the finished size. I saw your previously posted comment but I have looked all over and still never found the size. The Creation yarn pack includes: 49 x 50g balls and I recommend a 4mm G hook. Are there any yarn packs for this beautiful pattern please ? There are now two yarn packs available in my Deramores shop…. PLEASE TELL ME THAT THE PATTERN WILL BE AVAILABLE FOR A LONG TIME. I NEED TO WAIT UNTIL MARCH 15 TO GET IT!!!!!!!!! I DO NOT WANT THIS TO BE THE ONLY ONE OF YOUR BEAUTIFUL PATTERNS THAT I DO NOT HAVE!!!!!!! I have just purchased this pattern and as usual you have created a really beautiful design. I am getting more used to following US terminology but still prefer UK abbreviations. Will UK terms be available for this pattern in the future? Thank you for such lovely, vibrant designs – looking forward to seeing the new CAL as well. don’t forget you are working on the wrong side to do round 44, and if your stitch count is correct and you have not skipped any stitches it will work out correctly… maybe put a stitch marker in the centre sc at the top of the point, so that when you turn to work R44 you can easily see where to start/finish. You are such a talented woman. Thank you so much for making such wonderfully fun patterns for us to enjoy! All the colors you ladies have done are simply amazing! This is one of my fav patterns! Oh my goodness! That’s all. No other words! Can you please send me the link to the pattern? I can’t find it. Thank you Helen for the reply purchase made and will start soon as I get organised.